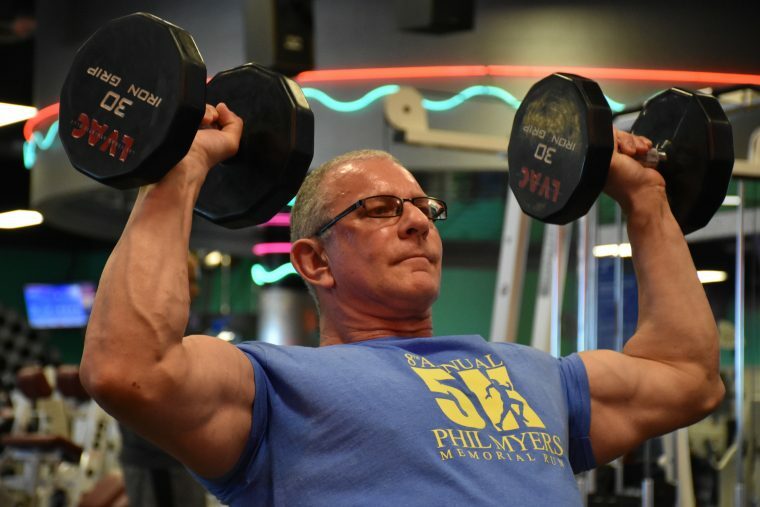 I shadowed Robert Irvine for 36 hours through Las Vegas and just barely kept up. But by the end of the trip, I had a new perspective on what makes a tireless man tick. 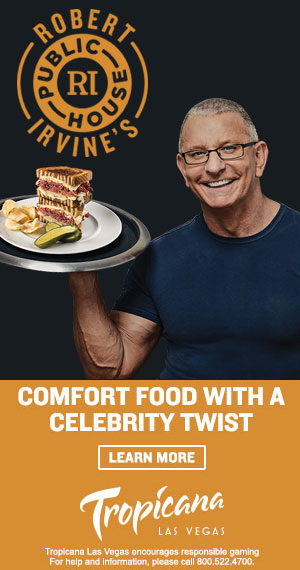 Robert Irvine doesn’t walk. At least not like you and I do. Typically, his pace is one level above brisk, too fast to comfortably keep up with unless you assume a more athletic stance—like puffing your chest out and tilting your head back like a speed walker. It would be easier keep astride him if you broke out into a light jog, but since his speed is effortless, you’d look like a tool. So instead, you just do your best, which leaves you a little sweaty and step or two in his rearview. At the moment, he is thundering through Las Vegas’ McCarran International Airport in his trademark black loafers, dark blue jeans, and skin tight navy tee at a pace I want nothing to do with, laser-guided to the baggage claim area. He has two employees in tow—his assistant Ryan Coyne and a writer (yours truly)—plus a friend, Coyle, from the east coast. Coyle’s history with Robert stretches back to when the chef lived in New Jersey and ran the restaurant at the Trump Taj Mahal in the mid-90s. Moments later we find a driver holding an “Irvine” sign and we’re headed for the exits. If anyone recognized the star of Restaurant: Impossible and the then-current Worst Cooks in America on Food Network, they weren’t quick enough to stop and ask for a selfie. Ryan and Coyle pile into the SUV. I ride shotgun with Robert directly behind me. “How’s the wife?” he asks. I chuckle and try to explain that the design process I’m managing for his upcoming fourth cookbook, Family Table By Robert Irvine, is well underway and that I could use his input on some mock-ups, but I’m too slow. The first check-in I’ve had with my boss in the past three weeks is officially over, cut short some 20 seconds in by a billboard draped on the outside the MGM Grand advertising tomorrow night’s heavyweight title fight between Triple-G (Gennady Gennadyevich Golovkin) and Canelo Alvarez. It reminds Robert of a different breed of heavyweights. Tomorrow night Robert will attend the 54th annual Mr. Olympia competition across town at the Orleans Arena. His friend Phil Heath—who once appeared as a guest star on Restaurant: Impossible—is gunning for his eighth straight Olympia title, which would tie him with Ronnie Coleman and Lee Haney for the most wins all time; he is currently tied with Arnold Schwarzenegger for the second-most wins. Unlike GGG-Alvarez, the Olympia highlights won’t make it to ESPN, but in the bodybuilding world, there’s no bigger event. This year’s winner walks away with $400,000 in prize money, which ain’t bad for never having to take a punch, plus the potential for the really big payday: millions of dollars in supplement endorsements. Having worked for five years at Muscle & Fitness magazine, whose parent company AMI owns and operates the Olympia competition, I understand Robert’s ominous claim. In any sport that uses judges instead of an objective measure like runs or touchdowns, politics will always play a role. The historical shadiness of the fitness industry—and bodybuilding in particular—opens the door even further for claims of foul play. With Robert so excited on Phil’s behalf, I’m now a little worried that Phil won’t win. I have some historical context to add to this and want to note that besides audience qualms, bodies start to break down as you close in on a decade of carrying so much muscle mass, which explains why no one has ever won more than eight times. I open my mouth to speak, but I think better of it, feigning a yawn. I’m glad Robert can’t see my face in the front seat. Besides the bags under my eyes, he’d see my soul-crushing disappointment. I’m currently running on fumes; I’m still on New York time so that means my stomach is rumbling for dinner and I’ve only eaten airline snacks during my five-hour flight. As a father to a two-year-old who wakes in the pre-dawn hours, one of the things I was most excited about for my trip to Vegas was the prospect that I would get an afternoon nap before that evening’s welcome dinner with the FitCrunch team. The driver is now approaching the Tropicana. “Right out front, yes?” he says. I’m glad the Tropicana gift shop carries FitCrunch bars. It must’ve been part of the deal that saw Robert Irvine’s Public House become the main dining attraction there. I snagged a cookie dough bar before we left the hotel and I’m finishing it as we walk in the doors of the Las Vegas Athletic Club, a sparkling attraction filled with tons of new gear—plus a lot of well-maintained old-school machines they don’t make anymore. Between that and the teal-and-purple stripes painted on the walls, the place has a comforting mid-90s vibe, hearkening back to a simpler day when home run numbers exploded, players started bursting out of their uniforms, and everyone thought it was just the supplements. Good times. It’s a scene that really makes a man thirsty for some creatine, which is undoubtedly part of what Robert orders at the smoothie counter: a generic, ruby-red pre-workout they serve to him in a Styrofoam cup with a coffee stirrer. Robert sips on this while Ryan and I show our IDs. The young man behind the counter makes copies and hands us waivers to sign. When we move to pay him, he shrugs. Robert happily obliges, personalizes the note, and we all walk in for free. A fitness model stops him for a selfie and skips away giddy. A towering man with bulging biceps takes off his headphones as Robert walks by. Robert laughs and has a word with him. The guy is too cool to ask for a picture, which Robert no doubt appreciates. He then hits the elliptical and says he wants 20 minutes to warm up, which is great. I hop off my machine after 10 minutes and hit the mats to stretch, terrified I’m going to hurt myself. Fifteen years ago when I was college, I wouldn’t have been worried about holding my own. Heck, even a couple of years ago before my son was born I’d have welcomed a workout with Robert. But today, I’m less worried about keeping up than I am with making sure I don’t pull something or pass out from dehydration. It might ruin his day. In the end, I luck out. No leg training, just an old-school shoulder blast. As heavy as the weight gets or as high as the reps go, I’m ok. Shoulders are small muscles and won’t gas you out no matter how hard you work them. My shoulders will be sore in the morning, but the comment stings a little more. Aside from telling me a few times to slow down and concentrate on my reps, Robert doesn’t join the chit-chat. He doesn’t “go to the gym.” He trains. This is serious business—as it would have to be for any man aged 53 years to exhibit his extraordinary condition. His arm veins—normally prominent and visible at rest—engorge to the size of garden hoses while he lifts. His shirt gets tighter at the shoulders, too, and looks like it’ll shred at any moment. In a few hours, he’ll be beaming for selfie after selfie as he holds court in his restaurant, but at the moment, no one would dare think about pestering him. “Right, then. My room. Six o’clock,” Robert says. He scrolls through his phone, checking e-mail. I’m elated as I do the math in my head. If I iron my shirt now and take a very quick shower, I could nap for 45 minutes before I have to get up and throw on my clothes. I don’t just snooze. I’m in a deep dream when my alarm goes off. Back home I’d just be finishing story time with my boy and getting ready to go to bed myself. The bright sun outside doesn’t jar me out of my stupor. My brain is still on the east coast. My legs feel like cement as I shuffle to the bathroom. I remember Robert’s preposterous travel schedule and I can’t make sense of it. I guess jet lag never comes for you when you’re always on the jet? When I come in through the massive double doors, Ryan’s making cocktails and Robert and Coyle are in deep conversation, so I just give them a nod. The entire room is outfitted with floor-to-ceiling reinforced windows. I stroll over and take in the sunset: the concentrated excess of the strip up close and the infinite nothingness of the orange-tinted Sahara beyond it. Ryan hands me a chilled glass of Patron. It’s easy to see how this could go to someone’s head. You feel like a king up here. We toast. I tell him what’s new with the magazine and finally get to show him the book mock-ups. He likes most of it, but points out a few photos he wants deleted from the layouts. I take the notes and he quickly tells us what’s new with Robert Irvine Foods and a few potential TV projects. After a few minutes he checks his phone. We follow him but take roadies. There’s a steady rising echo of, “Oh, that’s him!” as Robert walks past a small line of people waiting to be seated. He smiles and waves, stopping to take a selfie with anyone who asks. 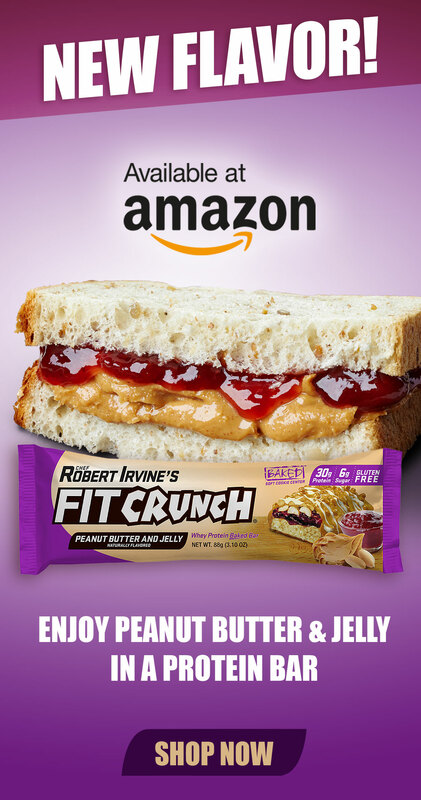 He then heads to the kitchen to see how the food is coming, then to a circle of reserved tables where he meets with Team FitCrunch, including Pervine Foods CEO Patrick Cornacchiulo, the FitCrunch Marketing Director Dave Plowden, and the Brand Manager Elena Fusaro. Filling out the half dozen tables are a huge number of FitCrunch brand ambassadors: young weight lifters, bodybuilders, and Instagram influencers who will spend the weekend operating the FitCrunch booth at the Olympia Expo, doling out samples of protein shakes, bars, and his new FitCrunch puffs. After a tequila toast and a group photo, Robert and the team sit for an unbelievably delicious seven-course meal that sees most of these super-lean 20-somethings tap out about halfway through. I don’t have any problem with the eating, but by the end of the meal I can barely keep my head up to make conversation. It’s midnight on my coast, and tomorrow’s a big day, so I politely excuse myself and head back to my room. As I walk out the door I glance back; Robert is animated and holding court, with no end to his evening in sight. I’m proud of myself. Not only did I wake up in time to go to the gym with Robert, I’m the first one at the door. I take a sip from my water bottle and smile, cocky as hell to have Robert waiting on me for a change. Yes. That’s the one. I’ll do that—if he seems in a good mood, anyway. I pace around for a few moments then glance at my phone. I get a sinking feeling; it’s 6:10 am. That’s seriously late in Robert Irvine time. I call Ryan. “Where are you guys?” I ask. I’m miffed for all of ten seconds before I realize Robert is training for two hours this morning… which means I get to sleep for two more hours! Hey, at least my heart was in the right place, yeah? I’m dressed for the Olympia Expo, waiting within five feet of Robert’s SUV, ten minutes before we’re scheduled to leave. He comes out five minutes later. I’m only relatively new to Team Irvine because his core team has been with him for close to a decade. Still, I’ve been with him for almost three years and really should know the rule by now. I make a move to apologize but it’s obvious he doesn’t care. Not in any callous sense, but in the sense that he spends not one minute dwelling on the past. He’s back to business: calling a few of his company officers who live in different parts of the country for status updates, getting in a FaceTime call with Gail, and conversing with fans on Twitter. In the parking lot of the convention center, Robert cuts a video for FitCrunch social media with Plowden recording on his cell phone. Plowden then hands everyone an Expo pass on a lanyard and we head inside. For the uninitiated, the Olympia Expo is a strange concept. Most people don’t know what the Olympia bodybuilding show is, never mind that it has a companion expo that’s held in a different location. The short of it: The Olympia Expo is basically a big convention; think Comic-Con, but without the movie stars, writers, artists, rare merchandise, costumes, and all that. So… it’s a convention, but without the culture aspect, meaning it is basically a big crowd of sweaty muscle heads. At least that’s how you’d see it if you didn’t have a deep respect for what bodybuilders, powerlifters, and even fitness models go through to stay on top of their game—and I most certainly do. If I’m being honest, I have to admit that walking from booth to booth with a chance to bump into Olympia champions of yesteryear is very cool. If you take supplements or eat protein bars, you get to eat and drink your way through the floor for free, as well, trying all the latest and greatest the industry has to offer while taking in powerlifting competitions and various figure and physique shows. When Robert arrives at the FitCrunch booth, there is already a line of about 50 people snaked around the corner. Over the next three hours there will not even be two minutes to pause as he stands on his mark, taking photos and signing autographs with eager fans who are among the first in the world to sample his new FitCrunch protein puffs. (Read our story about the puffs in the Winter edition of RI Magazine.) The puffs are a big hit; one editor from a major fitness magazine who didn’t bring lunch returned frequently throughout the day to collect samples, which was the only solid food he had that day. Robert spends a few extra minutes at the FitCrunch booth, making sure that everyone who wanted to meet him got the chance. 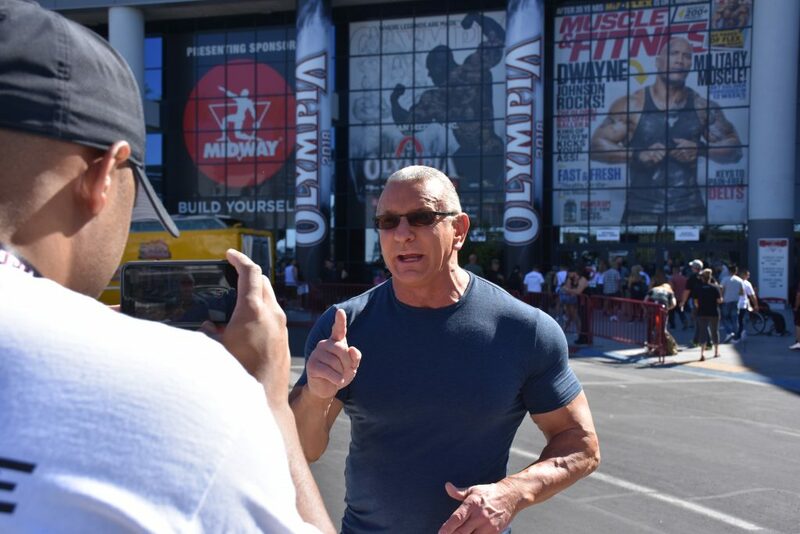 Then he stops by the Muscle & Fitness booth for a quick video interview with the editor, then he’s off to the exits where his car is waiting for him. The driver punches in the address of a hotel where Robert has a series of meetings with potential FitCrunch distributors. After a five-minute wait to allow an enormous crowd of pedestrians to pass, we roll out of the parking lot—and across the street, no more than 200 yards from where we were picked up. After the meetings, we went back to the hotel to shower, have a quick lunch, and get dressed for the Olympia finals. Gail is due into town in less than two hours and she hasn’t seen her husband in days, so we won’t be staying for the full show, but Robert still wants to make a show of support to Phil. Backstage we run into Jeremy Buendia, the Olympia Physique champ (a variety of bodybuilding that rewards smaller, more aesthetically pleasing bodies) who saw his reign end earlier that day. Robert tells him to keep his head up. We run into some more friendly faces, including photographer Ian Spanier, who shot Robert for his two most recent books, Fit Fuel and Family Table, as well as the M&F staff. The entire competitor field is in a nearby “pump-up pen” where they curl and press light loads for high reps to flood their muscles with blood and appear fuller on stage. No matter how many photos of bodybuilders you might have seen in your life, you’re never quite prepared for seeing a bodybuilder in person—at least not once they’re all oiled up and wearing nothing but a pair of skimpy posing trunks. It’s at once unnerving and breathtaking: The incredible size and distinct shape and separation of each muscle is outrageous, even on the competitors who will finish at the bottom of the field. Then Phil himself emerges from a privacy curtain, slathered in posing oil, his muscles looking incredibly swollen before he’s even had a moment to pump up. They speak for a few more minutes, then Robert asks me to call the driver as we head for the door. We wait outside the arena for too long—at least 20 minutes go by. The driver either got lost or stuck in traffic. I make the most of it by pumping Robert for stories about his early days in the States. He tells me details I’ve never heard before. It turns out that his reputation as a no-nonsense kitchen general began while working at the Taj Mahal, where, in addition to revamping the menu, he rooted out corruption amongst the staff. The Trump Organization had turned to Robert to stop the restaurant from losing money and Robert delivered, discovering a circle of employees who would take turns clocking each other in but never actually showing up for work. In other instances, entire purchase orders would be signed for but delivered elsewhere. By the time Robert cleaned house, the Taj Mahal restaurant was profitable. It sounds like the most contentious episode of Restaurant: Impossible ever, with a future President of the United States as the owner in need of help, and we’ll never get to see it. It’s almost heartbreaking. I want more stories, but Gail is calling; she’s at the restaurant, dressed for dinner and wondering where the hell her husband is. I spot a Lyft driver and flag him down. He asks that we hail him on the app, but it’s taking too long. Robert throws him some cash and we’re off. As per usual, Gail is dressed to the nines. If she’s pissed at her husband for being late to dinner she doesn’t show it. In fact, she and Robert don’t even get a private table to decompress. They eat at the bar with the FitCrunch team milling about having drinks. At one point, someone brings a cell phone over to Robert and alerts him that the Olympia final results are being announced. Robert orders a hush over the bar. 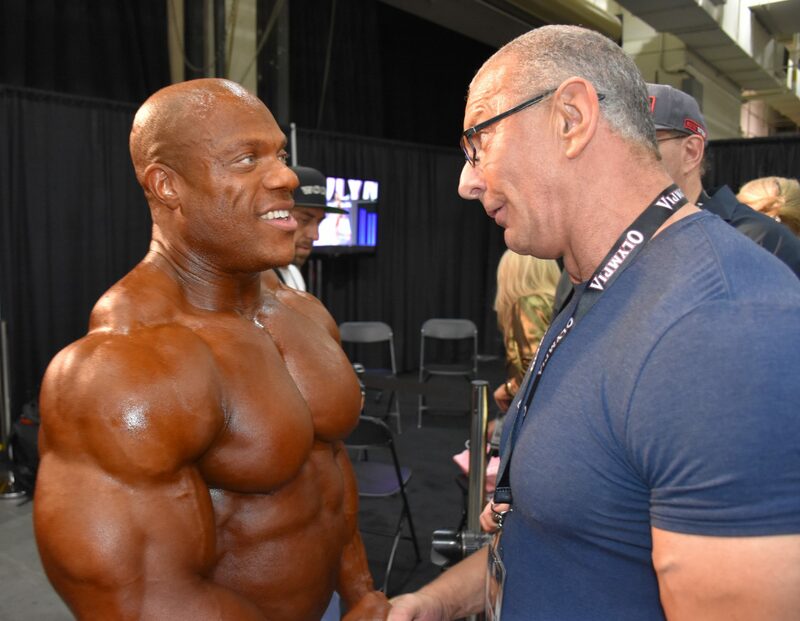 You can hear a pin drop as stares at the phone; the field has been whittled down to two with Phil Heath and Shawn Rhoden standing center stage. There’s no volume on the broadcast, so we only have the reactions of the men to go by. After an interminable pause, Phil bows his head and Rhoden raises his hands victorious. There’s a new Olympia champion. “Oh, you’ve got to be kidding me!” Robert shouts. No disrespect to Phil, but I personally felt Rhoden looked great. I want to talk about respect for both men. Instead I say nothing. Just then my attention turns to a man in a suit and a woman in a wedding dress. They tell me they are Jessica Fisher and Eric Simon. They met at a Halloween party where he was dressed as Fred Flintstone and she was a pirate. 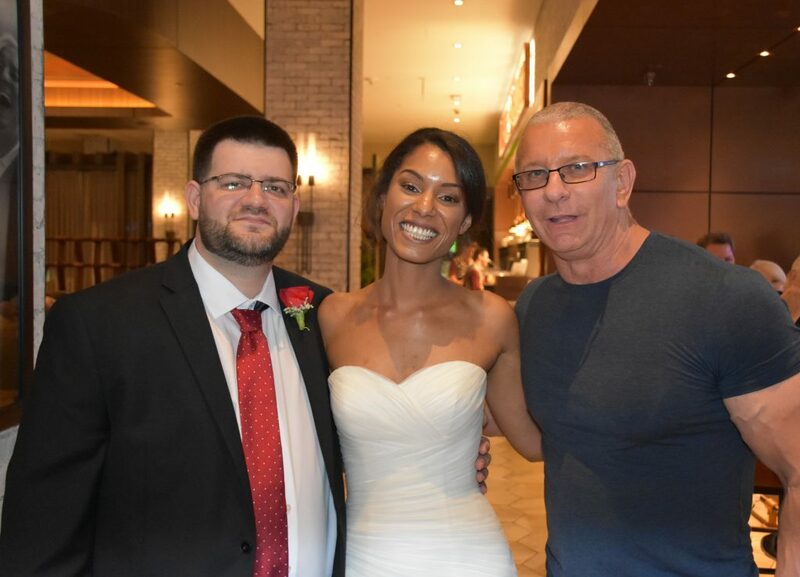 They’ve just been married at the Wedding Chapel in the Tropicana and held their reception right here at Robert Irvine’s Public House. Now they get to cap their reception by taking a photo with the world-famous owner, who quickly recovers from the bad news about Phil to smile for the pictures and buy them a round of drinks. They walk to the exit to begin their honeymoon. Robert and Gail follow soon after, headed to bed to rest up for brand-new adventures in the morning. Gail will go back to work producing for IMPACT Wrestling. Robert will head to Dallas to cook for a charity function. I’ll head back home arrive in time for story time, a tired survivor of 36 hours that, on Robert’s Chaos Scale of 1-10, don’t even register above a 3. Before they leave I nod to Robert. Here he pauses to smile at Gail. Their day-to-day lives briefly flash before my eyes—the endless travel days—with the USO and military charity functions accounting for almost as much of it as their actual careers. I know the drill well, but the reality of living it is still inconceivable to me, and once again, I’m humbled.